As mentioned, punk/indie pop trio Lemuria are releasing their new album, The Distance Is So Big, on June 18 via Bridge Nine, and they’re currently on a tour ahead of its release. That tour hits the NYC-area twice this weekend, including shows TONIGHT (5/24) at Maxwell’s and Saturday (5/25) at Shea Stadium with Bridge and Tunnel, Jeff Rosenstock (of Bomb the Music Industry), and ex-Snowing frontman John Galm’s excellent new garage punk band, Slow Warm Death (who we just profiled). Advance tickets for the Maxwell’s show and the Shea show are still available. 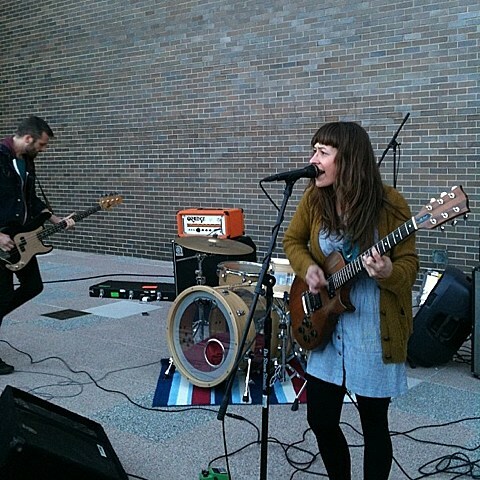 We’ve still got a few weeks before Lemuria’s new album hits shelves (or iTunes libraries), but they did reveal a taste of it with the album’s lead single, “Brilliant Dancer.” That single was released digitally and on vinyl this week, and the band are also selling copies on tour. The single comes with an exclusive non-album b-side, “Helloing,” which is just as good as any of the standouts on The Distance Is So Big and not just some throwaway track. Check out the new song below via Spotify, along with a list of updated dates.